There might be some temptation to confuse this book with Naomi Novik's Temeraire series (all of which I've also read and/or own). Don't. The concepts are similar: dragons grafted on to Earth's history and ecology. In Novik's series, it's England in the time of the Napoleon Wars; in Brennan's, it's England (the names are changed, but it's still a thinly disguised England) in the time of Queen Victoria. The formal, eighteen- and nineteenth-century storytelling modes are also the same. Sometimes they're a bit jarring, but they fit their time, place and subject matter. Having said that, the approaches of these two authors are vastly different. Naomi Novik is concerned with the stories and lives of her dragons; if this was not evident in the first few books, it certainly is with the latest book in the series. Novik's dragons are sentient, speaking beings, sometimes regarded as full partners with their humans (or even ruling over them), and sometimes thought of as little more than slaves. Brennan's dragons are very much considered animals to be slaughtered for study and/or eliminated at a human's whim, although in this first book (with its old-fashioned memoir format, and the protagonist only covering the first twenty years of her life, I'm assuming there will be more) there are hints dropped that the dragons may be more intelligent than anyone thought. 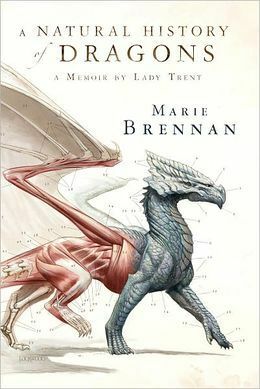 Nevertheless, in Marie Brennan's world, the focus is not on the dragons but on the humans studying them. That being the case, the horrorshow that is Victorian England is brought clearly into focus. I was aware of the classism and sexism of the times before this (for instance, teenage girls lived only to catch a husband, and once wed, became the property of said husband), but the wonderful voice of Isabella, the protagonist, slammed this terrible situation home. (I would very much like to meet the older version of Isabella in real life, and I can't think of a higher compliment for an author than to have her character regarded as such a complete, rounded person.) She has to beg her husband to let her have her little scientific experiments, and to go with him on the dragon expedition. Her husband could clearly rule her every move, although he chooses not to do so. Great Flying Spaghetti Monster. The thought of me, as a woman, living like that is appalling. The classism is also evident, although it's not as obvious as the sexism. As far as I can tell, there are no people of color or gay people in this book, but the references of Isabella's dealing with her maid as someone who needs to learn from her "betters" is not flattering. It's part and parcel of the times, of course, but that doesn't make it any less reprehensible. Despite this, I would recommend this book, mainly on the strength of its wonderful protagonist. Just be aware of what you're getting into, and thank all the gods society has evolved beyond the shameful situation depicted here. Sign into Goodreads to see if any of your friends have read A Natural History of Dragons.